Now you'll save the egret selection as an alpha channel mask. Your time-consuming work won't be lost, and you can use the selection again later. Quick masks are temporary. They disappear when you deselect. However, any selection can be saved as a mask in an alpha channel. Think of alpha channels as storage areas for information. When you save a selection as a mask, a new alpha channel is created in the Channels palette. (An image can contain up to 24 channels, including all color and alpha channels.) You can use these masks again in the same image or in a different image. Note: If you save and close your file while in Quick Mask mode, the quick mask will show in its own channel the next time you open your file. However, if you save and close your file while in Standard mode, the quick mask will be gone the next time you open your file. 1 Choose Window > Channels to open the Channels palette in the Layers palette group. In the Channels palette, the default color-information channels are listed—a full-color preview channel for the RGB image and separate channels for red, green, and blue. 3 When you finish experimenting with the channel views, click to set an eye icon for the RGB channel to redisplay the composite channel view. 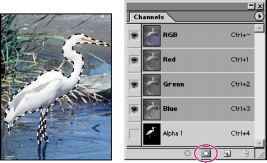 4 With the (Standard Mode) egret selection still active in the image window, click the Save Selection as Channel button (_|) at the bottom of the Channels palette. A new channel, Alpha 1, appears in the Channels palette. All new channels have the same dimensions and number of pixels as the original image. In addition to the temporary masks of Quick Mask mode, you can create more permanent masks by storing and editing selections in alpha channels. This allows you to use the masks again in the same image or in a different image. 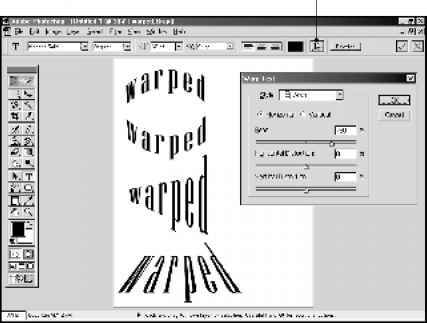 You can create an alpha channel in Photoshop and then add a mask to it. You can also save an existing selection in a Photoshop or ImageReady image as an alpha channel that will appear in the Channels palette. • You can edit the mask in an alpha channel using the painting tools, editing tools, and filters. 5 Double-click the Alpha 1 channel and type Egret to rename it. If you display all of the color channels plus the new alpha mask channel, the image window looks much as it did in Quick Mask mode (with the rubylith appearing where the selection is masked). Alpha channels can be added and deleted, and, like quick masks, can be edited using the painting and editing tools. To avoid confusing channels and layers, think of channels as containing an image's color and selection information; think of layers as containing painting and effects.